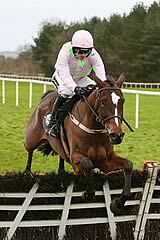 Returning in trip to two and a half miles today, Min raced in third under Ruby Walsh. He went for a gap approaching the second last, but the door was firmly shut by Jack Kennedy on Shattered Love, with Min quickly switching to the inner. He soon came with his challenge on inside, and got to the front before the final fence, keeping on well under pressure on the run-in, seeing off the late effort of Shattered Love by a length and a half. Balko Des Flos was another two and a half lengths back in third, with Rachael Blackmore aboard. "Ruby was maybe a bit bold there but he had to do what he had to do," said Mullins. "It was good and the horse responded. He jumped brilliant and I was very pleased with that. "I don't mind going back to two at all, he pulled very hard in behind there today, and he has the speed for two. "He'll probably go back in trip for Christmas but we'll see what we have in his division. "We have Un De Sceaux there and Great Field so we could try and keep this fellow at a longer trip and try and find races for him. "It didn't look like he was stopping today but it was a very slow run race, I thought, and he was very keen in behind but I liked the way he jumped even though he was keen. "I'm not looking to go out to three miles with him to be honest ." On Great Field, Mullins added: "Great Field is fine and Jody is fine. "The horse got up and galloped around and jumped afterwards. David Casey was very happy with him anyway." Min was completing a double for Ruby Walsh, and a four-timer for Willie Mullins.